This is the boat originally owned by cousin Gibbs. It is a specially designed boat for moss harvesting. It was built in the 1800s out of one cypress tree. Even holding all those people it only sinks three inches. On my second trip to Morgan City I prepared the way but calling the newspaper, radio and television stations in the area. Everyone was very open to helping me get the word out that we were coming to town to interview anyone who knew anything about the Tarzan film which had been shot there. The local newspaper The Daily Review gave me a major portion of the entire back page including a photo and illustration to announce our being in town. I went by and met the editors and thanked them for their help. As with everyone we met, they were excited and extremely helpful to the project. The local television station ran PSAs (Public Service Announcements) as did the radio stations. Danika Foley from television station KWBJ came out to interview me to help get out the word that we were in town to interview any and every one. The Artist Guild which is in the Everett Street Gallery was very helpful and kind enough to open their building on Saturday morning for interviews. A few days before we came to Morgan City, I received a call from a barber in Thibodaux (Tib-a-doe) which is about 30 miles east of Morgan City on the way to New Orleans. Danny said that he had a boat that was used in the 1918 film. He said it had belonged to Jerry Dupree's uncle and Jerry knew all about the boat. On the Saturday we had our interviews, a man named Roger showed up with the 15- to 18-foot boat on a really long trailer. I tried to lift one end but it must have weighed 300 pounds. Danny intended to come along with Roger but couldn't because he had hurt his back. The boat was really something to see. It was very old and had so many cracks in it that I didn't see how it ever floated. Roger gave us the history of the boat. It was built in the 1800s out of one cypress tree. He assured me it would still float but you had to sink it and keep it under water until the wood swelled and tightened up. 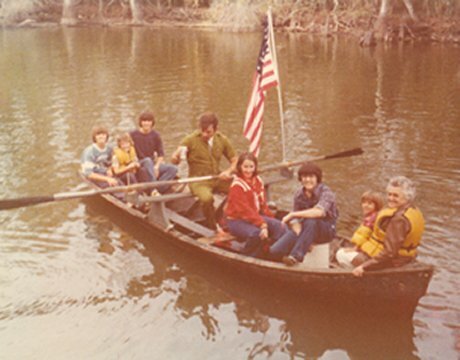 It was a boat specially designed for gathering moss from the trees in the swamp. Before "sleep number" beds there was a local industry for stuffing pillows and mattresses with moss. One man stood up to row the boat forward or backward. The boat could easily hold 500 pounds of moss placed in the back and front of the boat. Even with all that weight this type of boat would only go down three inches in the water. One of the oars was broken. Roger said that the boat had been used recently in the film The Curious Case of Benjamin Buttons and the film crew had broken the oar and never even apologized. Roger, Danny and Jerry had gathered everything that had been passed down to them and they felt that the parts of the Tarzan film that the boat had been in were cut when the film went from being nearly three hours long to the current 70 minutes. It was also a possibility that the boat had been used to carry film equipment around. Jerry told me that Bill Parson's film crew showed up at his uncle's home in an old model-T truck, rented the boat and drove off with it. They returned it in the same condition when the film wrapped in Morgan City. is used again for the movie "The Curious Case of Benjamin Buttons."